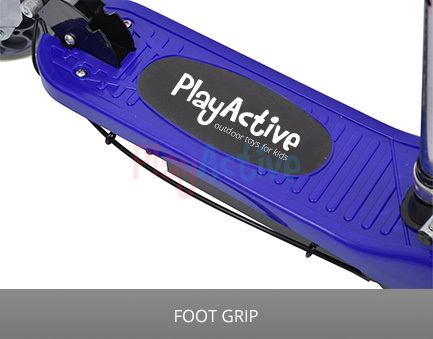 The PlayActive electric scooter boasts a powerful 120W motor and can reach speeds of up to 12km/h – faster than most others on the market. So the rider can safely control their speed the scooter comes equipped with a responsive brake lever attached to the left handle and also a large foot grip for stability. 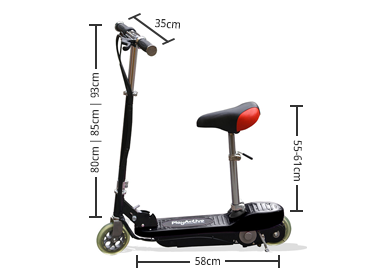 To ensure a comfortable ride the scooter features a black/red padded seat that can be adjusted or even removed so you can transform it into a stand-up scooter as required. 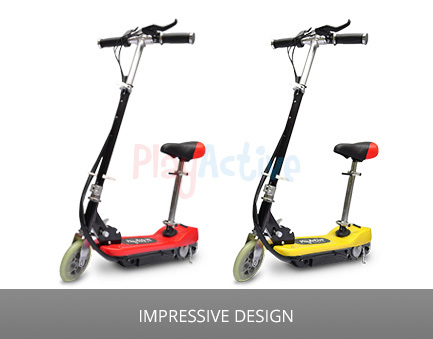 In addition to these other great features the scooter has been designed with UV protected plastic so its colour will never fade and always remain vibrant. PLEASE NOTE: Images featured are a guide. 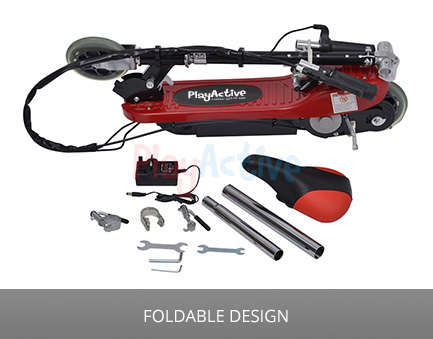 The PlayActive electric scooter boasts a powerful 120W motor and can reach speeds of up to 8mph – faster than most others on the market. So the rider can safely control their speed the scooter comes equipped with a responsive brake lever attached to the left handle and also a large foot grip for stability. 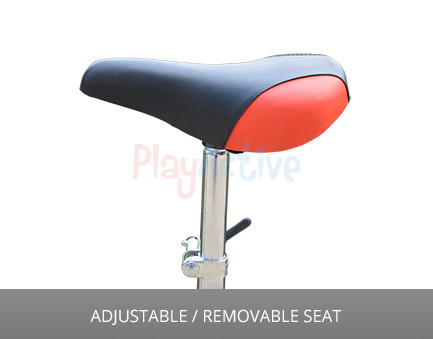 To ensure a comfortable ride the scooter features a black/red padded seat that can be adjusted or even removed so you can transform it into a stand-up scooter as required. 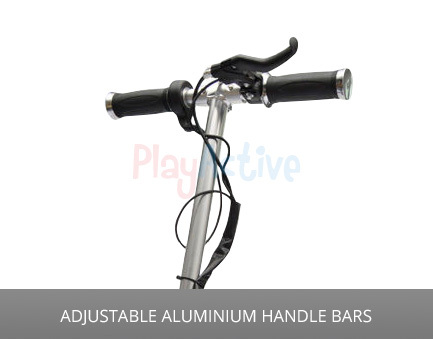 In addition to these other great features the scooter has been designed with UV protected plastic so its colour will never fade and always remain vibrant. 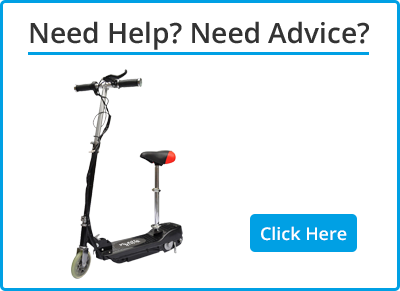 It is advised by the manufacturer that the scooter is ridden by ages 14+, however it's also ok for children ages 6 and over as long as they are under parental guidance. 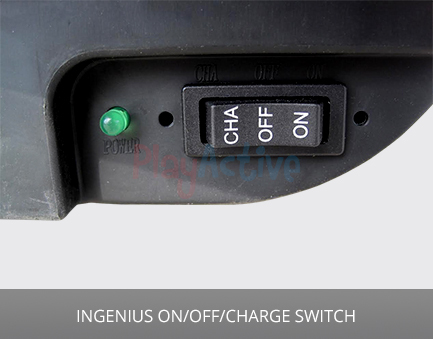 Our latest model has a newly developed 24V battery that can be fully charged in just 3 hours and allows the scooter to cover distances of 10-15km! (weight and terrain dependent). And finally if you wish to travel with your e-scooter then no problem, our model can be folded down for easy transport and weighs only 10kg. 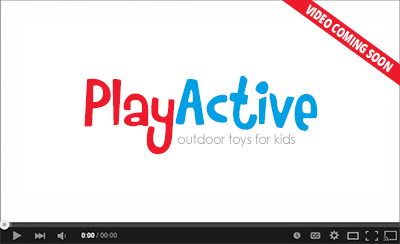 Available in 5 stunning colours: Black, Red, Blue, Yellow and Pink.